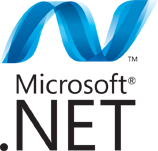 Microsoft .Net is a software development framework developed by Microsoft that allows cross language development along with providing a large standard library. Ardent is one of the leading offshore development firm in the field of web application development based on .Net platform. Our team of highly skilled and qualified professionals have hands on experience on ASP.Net,C#,VB.Net Our . Net application development services enable our customers to integrate their systems more rapidly and in more responsive manner and help in getting secured information on any device. Advance Data Set management, caching, synchronization, automation of data access layer. Reporting (Crystal Reports, Microsoft SQL Server Reporting Services) and many more…..
Because of affluence of skilled and professional resources on Microsoft platform our pricing structure are kept extremely competitive, ensuring that our customers receive a best solution for comparatively low cost.